FILE - Now, it's down to just two: Republican presidential nominee Donald Trump and Democratic presidential nominee Hillary Clinton. Flying high from making history at the Democratic National Convention by becoming the first woman candidate for U.S. president, Hillary Clinton began her campaign Friday by telling voters in the convention city of Philadelphia that they have a lot of work to do. "I can't think of an election that is more important, certainly in my lifetime," she told supporters before starting out on a bus tour of Pennsylvania, which is regarded as a key battleground state in the November 8 election. With husband and former President Bill Clinton's arm around her shoulder, Clinton and running mate Tim Kaine climbed aboard a big blue bus with the campaign slogan "Stronger Together" painted on the side. Democratic presidential candidate Hillary Clinton gets off her campaign bus as she arrives for a rally at K'NEX, a toy company in Hatfield, Pa., July 29, 2016. They stopped in the state capital of Harrisburg before heading to the industrial cities of Pittsburgh and Youngstown, Ohio — places where she said people "are making things." Meanwhile, Trump, whose often insulting rhetoric has become a trademark, said he was "taking the gloves off" and would no longer be a self-described "nice guy" when dealing with Clinton. He spoke Friday to a crowd in Colorado Springs, Colorado, calling Clinton's nomination acceptance speech "average" and a "sad situation." He also said it was full of lies about him. 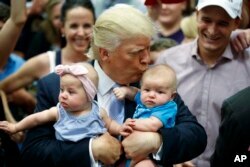 Republican presidential candidate Donald Trump kisses Kellen Campbell of Denver while also holding Evelyn Keane of Castle Rock, Colo., during a campaign rally in Colorado Springs, Colo., July 29, 2016. When he mentioned Clinton's use of a private email server while serving as secretary of state and why the FBI chose not to prosecute her because of the way she'd handled classified information, the crowd began chanting "Lock her up," suggesting Clinton should be jailed. Trump refrained from embracing the same sentiment during the Republican convention, but he said Friday that he was starting to agree with it. Presidential nominees can often expect an immediate rise in the polls, called a post-convention bounce, when the acceptance speeches, balloons, and parade of personalities are still fresh in voters' minds. A CNN/Opinion Research Corporation poll showed support for Trump jumping after his convention last week from 42 percent to 48 percent, his best showing since last September. But a CBS poll out the same day showed no net bounce for Trump at all. It is too soon for polls to assess any bounce for Clinton. She accepted the Democratic Party's nomination for president Thursday night with a message stressing the need to unite in order to confront the nation's challenges. "It truly is up to us. We have to decide whether we will all work together so we can all rise together," Clinton said in an address on the final night of the convention. Clinton and Trump Square Off for the Presidency; What's Next?